For phone call recording in a small office or call centre, the Algo Enterprise Call Recorder (ECR) is an idea solution. 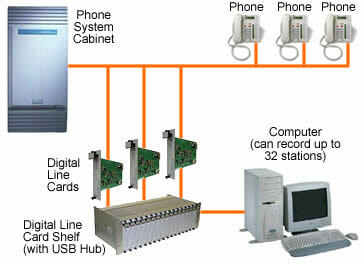 Phone calls are captured through a digital line card and calls are recorded directly to computer. Through the ECR software, calls can be retrieved, notes added by call center agents (or supervisors) and reports generated to show overall call volume and individual agent efficiency. This powerful call recording system provides exceptional recording capabilities and is a superb addition to any business that requires the protection afforded by call recording. Supervisory features include centralized storage of call records for playback, search or emailing purposes, live call monitoring, and password protection. Multiple AuxBoxes can NOT record phone conversations without the ECR software. 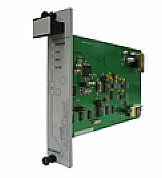 One AuxBox or Digital Line Card is required per station. Up to 32 stations can be supported on a single PC. This is an easy way to consolidate all phone calls recorded in one location. Software licenses can be purchased in multiple quantities to meet your specific requirements. A digital line card shelf holds 16 cards, so for 32 stations, a second shelf is required. Need to record more than 32 stations? Just add another computer! The call log files can be exported and combined to produce an accurate report for all stations. Another option if you are already using AuxBoxes that you want to record on the same computer is to use a standard USB hub in place of the digital line card shelf. You need to purchase software licences for the ECR software depending on the number of AuxBoxes you are using. Recording may be automatic or manually activated by pressing a key on the telephone or the computer. In manual mode, pressing the record key at any time during a call captures the entire conversation.